Grease a 30cm spring-form or loose bottomed cake tin and line the base with baking paper. Beat together the butter and sugar until light and creamy. Add the eggs, one at a time, and then beat in the sour cream. Add the almonds, flour and baking powder. Stir in three-quarters of the raspberries and spoon into the prepared tin. 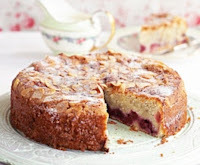 Scatter over the remaining raspberries, the flaked almonds and the extra tablespoon of caster sugar. Bake the cake for 1 hour to 1 hour 10 minutes, testing it with a skewer after an hour. If the skewer comes out clean when inserted into the middle of the cake, it is ready. The top of the cake should be wonderfully golden, crispy and cracking slightly. Leave the cake to cool in the tin for about 30 minutes before removing. Cut into wedges and serve warm or cold, just as it is or with a spoonful of sour cream.